What are the best work boots in 2018? We spend most of our daily hours at work; hence we must take all measures possible to make this environment safe as possible. Although Purchasing work boots does not seem like a difficult task or something you have to think about too much – it is a very important decision that will may affect your life. Buying the right work boots is crucial in case of an injury and it can really make the difference between fatal injury that has long time consequences or short term health issue. So where do we start? There are so many model and brands of work boots out there… How do we know which are the best one not only in terms of safety; but are comfortable enough for us? The Timberland Pro Men’s Pitboss 6” Steel Toe Work Boot is the latest in the line of men’s outdoor work boots from Timberland. The combination of lace-up design, all leather construction and max-tread rubber sole makes for a great winner when you need a shoe which is a good fit and one which is protective as well as comfortable for all day wear. This boot is unmistakably Timberland. However, this is more than what you can tell from the decals and branding. The quality and features are inherent in the boot’s performance when worn for work or for casual purposes. For all the appearance of toughness and resilience, these Pitboss boots are elegantly stylish as well as lightweight. All Leather Construction: The upper shoe section of this shoe is made of the highest quality, tanned cowhide leather. It is the guarantee you need that the show will last through different conditions and be none the worse for it. It is a shoe that is as durable as it is tough. It is also easy for cleaning and maintenance. Traction Efficient Sole: This boot features some of the most aggressive treading patterns available in the Pitboss series of men’s boots. The sole itself is made of a version of synthetic rubber compound. It is both lightweight and tough. It is also more flexible without danger of cracking. You can therefore count on the shoes offering you great traction even when walking on pretty smooth or moist surfaces. The boot will offer you good grip whether the surface beneath you is paved or not. Tough to the Exterior, Comfortable Inside: The shoe is designed for all types of work conditions. From the sole to the top of the boot’s shaft, the Pitboss is completely waterproof. The tanned and cured leather of the upper shoe is also tough enough to resist corrosion and tearing. The interior of the boot though is fully padded and lined to ensure you are comfortable and protected against the inevitable shocks, drops and knocks which take place in the course of working. Mid-calf Boot: The boot has a mid-calf shaft. It is designed for resilience and performance. The entire length of the boot’s shaft is waterproof so you can wade through inclement conditions without danger. The boot will offer the most all round protection for a shoe in this price range. Comfortable All Round Fit: These boots give such an appearance of toughness that it would be understandable when some people consider them uncomfortable. However, this initial assessment of the boots is often way off the mark. Once you get to try the shoes on you will be surprised by their easy, comfortable fit. This can be att5ributed to a number of factors. The most notable of this particular version of Timberland boots is the roomier toe box. It allows you breathing room and wiggle space for your forefoot and toes. As you can move your feet with greater freedom you can perform even more efficiently at the work place. Choice of Colors and Styling Options: Get a boot which suits your personality and preferences. The Pitboss 6″ Men’s Steel Toe Work Boot from Timberland is now available in a choice of three colors: rust brown, wheat brown and mossy black. They are all staid, cool and fitting hues to wear with your work outfit. What is more, the boots are now available in different fitting styles. You can opt for the traditional version with the standard sized toe box or the newer version whose toe-box is roomier and wider. Whether you are looking for a tough work boot or a piece of footwear you can easily match with the rest of your evening casual wear, you will find the Pitboss work boots from Timberland exactly what the doctor ordered. They come with our highest recommendations. As the summary of features presented above will serve to illustrate, no hyperbolic praise is required with reference to these shoes. However, you need not take our word for it. Follow the link provided here and access the boot’s product page where there are more detailed specifications as well as objective reviews posted by buyers just like you. If you’re looking for comfortable, practical footwear, the Irish Setter Men’s 83605 6″ Work Boot may be what you need. Its tough leather body provides ultimate comfort and durability, while its thick, high-traction sole makes it highly useful for various work terrains. Irish Setter prides itself in making durable, quality footwear. So whether your job involves surveying or factory work, you’ll be sure to find that these work boots can match your needs. Thick sole with high-traction grip Among all types of footwear, the main consideration would be the sole thickness and durability. The sole is one of the main shoe parts that gives any boot the right sturdiness for daily wear. The Irish Setter Men’s 83605 6″ Work Boot comes with a thick sole guaranteed to lessen the force on your feet and joints. Its wedge design also helps add comfort especially to the heels of the feet, which receive the most impact when walking. As you can see, the soles are designed to have a high-traction ability. This ensures that the boots can be worn on various surfaces and still give a good grip on the ground. Such a feature is ideal for work that involves moving about or going from place to place. Plus, it also has a heat-resistant outsole, making it resistant to melting up to a certain degree. Stylish yet comfy wear for the modern worker Every new pair of the Irish Setter Men’s 83605 6″ Work Boot requires very minimal break-in. Unlike other boots, the leather softens up even after a couple of days, which just shows how comfortable these boots can be. Also, if you’re looking for shoes with adequate support, look no further. This work boot’s EVA midsole offers impact-resistant protection for your feet as you go about your day doing the work you love. It also comes with a removable polyurethane foot bed for added support and comfort. These features offer a superior, secure fit. Even being in these shoes all day won’t make your feet ache! These boots come in the conventional lace up system, with metal eyelets to help hold the laces for a better fit. What’s more, they come in a manly Moc-toe design with triple stitching that goes well with most work outfits. Additionally, its padded collar and pull-up tab make it easy to slip on before rushing out to your workday. Its soft toe design along with its impact-resistant sole relieves your feet and knees of the stress that comes with a long day’s work. Sturdy design practical for all-day work use The Irish Setter Men’s Work Boots come in a sturdy, robust design fit for use during long hours of work. Its various features ensure that comfort is king whether you’re at work or just out and about. This work boot meets various work standards for foot protection as well, such as Electrical Hazard Safety standards (ASTM F2892-11). This means that it can be safely worn in areas that involve the presence of electrical components where accidentally stepping on live wires may be an issue. All of these great features make this boot highly reliable for being on your feet all day! Plus, every pair is sure to offer value for the price. You’ll see that even after a long day’s work, your feet are free from the fatigue and exhaustion of a weekday’s labor. The W02421 Raider Boot is a durable and comfortable work boot from American shoemaker Wolverine. The latter company has been in the shoemaking business for over 100 years and has acquired a reputation for producing high quality and reliable shoes. And the Raider boot is no exception. The boots are crafted from high-quality leather and are long lasting. Furthermore, the shoes are reasonably priced. Apart from being long lasting, the shoes look great especially when worn with casual wear. The debossed Wolverine logo on the shoes’ side and tongue add to their appeal. Measuring 15 inches by 5 inches by 5 inches, this boot offers great value for money. Comfortable design. The Raider Boot is designed with the wearer’s comfort in mind. Towards this end, the boot feature’s Wolverine’s couture welt design. 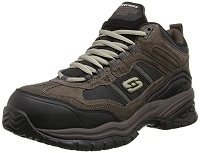 The six-inch MultiShox Contour system offers an extra cushion for the wearer’s heel and flexibility. Wolverine offers a 30-day money back guarantee. Buyers can return their boots thirty days after purchase if they feel the boot is not comfortable enough. This 30-day money back guarantee is a testament to how confident the shoemaker is in the comfort of the Raider boot. The area between the foot and the heel is designed for maximum flexibility while the foot and heel feature multipurpose pressure pads. The pads soak in shock and return energy. To crown it all off, the shoe’s collar is cushioned and comes with wave mesh lining to make the shoes’ breathable. Safe to wear. As a work boot Raider boot is designed to be safe. The outsole of the shoe has excellent traction. In addition, the sole is designed to be slip resistant on both oily and watery surfaces. The arch, or the area between the foot and the heel, is sufficiently deep for easy and safe ladder climbing. Some Raider boot variants come with a steel toe for improved safety. Appealing to the eye. The Raider boots come in two colors, black and brown. The brown Raider boot is more popular compared to the black version. However, both boots have a stylish appearance thanks to the full grain leather used in their making. Persons who wear work boots on a daily basis prefer the black version. Contrastingly, those who wear work boots from time to time prefer the brown version. Long lasting. The entire shoe is crafted from full-grain leather, which is a durable material. The sole, on the other hand, is made of rubber. Thus, the shoe is durable. The speed lacing feature makes them easy to slip on. The leather lace up shaft measures six inches while the midsole is crafted from lightweight polyurethane. The latter material is highly resilient and durable. In addition, the polyurethane midsole offers athletic type shock absorption. Bottom line, the Raider boot is a great work boot with a stylish design. It is worth noting that the boot is designed for moderate climates. Nevertheless, it fulfills its purpose as a work boot thanks to its patented MultiShox Contour system. Given the shoes’ price tag, they are well worth every penny spent on them. The Red Wing Heritage Moc 6” Boots are beautiful yet rugged looking pair of boots. They present themselves as stoic footwear that ooze confidence. The boots are suave and elegant. And this is the aura that you, the wearer, will emit. They will give you a poised nature and a certain vim for life that only comes from wearing superb shoes like these. Redwing provide these boots in ten different colors for you to choose from. You get the Briar Oil Slick, Oro- legacy, Black Harness, Charcoal rough and Tough, Concrete Rough and Tough, Oro-iginal, Oro-russet Portage, Copper Worksmith, Oro-Legacy and the standard black. Each looks unique and different from the other. And still, each presents a stylish appeal that’s characteristic with Red Wing shoes. But they aren’t just all about the looks. These boots provide total functionality. Durable Leather. Made of 100% genuine leather, the Red Wing Heritage Moc 6” Boots bear the hardwearing qualities that leather provide. And it starts with being waterproof. Your boots are supposed to walk the mile and take you to places you’ve never been. With these Red Wing boots, you’ll find yourself untethered. Being waterproof means you don’t have to worry about how they look or feel if it rains or if you’re walking a wet path. The boots will keep your feet dry, warding off the uncomfortable moisture. Bolstering this fine quality is the Norwegian welt construction that also gives it a pleasant aesthetic. Still, the leather retains its good looks and nice shape even after years of walking in the boots. Expect long service from your Red Wing Heritage boots. Comfortable Sole. Underneath the boots are thick, synthetic outsoles. The treaded design gives your feet a sturdy grip, ensuring you remain firmly on the ground. The rubber material effectively absorbs the discomfort of stepping on pebbles and stones. It’ll take in the pressure so your feet don’t have to. Also, being thick, uneven or rugged terrain doesn’t cause you discomfort in any way. And with the 1” heel, you’ll be able to walk a long distance without straining your ankles or heels. Wide Opening. Certain boots present a challenge when it comes to putting them on and taking them off. If you’re in a hurry you might find yourself getting agitated by the difficulty of such a simple task. What you need is boots that don’t resist your attempt at pushing your feet into them. What you need are boots with a wide enough opening. And the Red Wing Heritage Moc 6” Boots provide just that. They have openings that measure an approximate 6 inches in diameter. This is just the perfect size to give your feet enough room to painlessly pass through. You end up saving a lot of time in the process. And no one wants to take ages just putting on their shoes, right? Made in USA. This is a brand that the Red Wing boots bear with pride. It seems innocuous but the made in US tag means reliability. It means quality construction. It means total comfort. And all these are presented in the Red Wing Heritage Moc 6” boots. The Red Wing manufacturers are masters of quality craftsmanship assuring you of the expected high standards in these spectacular boots. These boots have all the right qualities. They’re strong, durable and beautiful. There’s nothing more one could ask for from a pair of boots. It’s time to get them for yourself. When heavy duty meets durability then you ought to be looking for the Caterpillar Men’s Second Shift Steel Toe Work Boot. What the elegant looking boot also guarantees you is the comfort that comes with it, making you enjoy the time at your work place. This Cat footwear embraces the long-time values that comes with the brand; genuine boots, designed for tough conditions and comes with a stylish and trendy look. Durable and tough. The genuine leather that elegantly covers the boot ensures that you are able to work in extreme conditions for a lengthy period that still leaves your boots as good as new. The oil-resistant traction out-sole. There is a neat stitching between the stylish leather boot and the out-sole which gives it a smooth look but the tenacity of the boot lies in within. The out-sole then guarantees toughness in a range of working areas hence durability. Comfort and designer-look. The padded collar which is visible from the outside is a key feature that guarantees comfort during all leg movements absorbing shock equally. The climasphere insole that is well padded is one designed with preciseness to abate foot fatigue. The cushioning and softening effect on the inner sole ensures comfort when walking around. The shoe boasts of a stylish look, the archetypal styling and rugged detailing which gives the shoe a trendy appearance. The durable metal eyelets efficient for lacing hence add to that stylish look for the boot. Genuine and original workmanship. The Caterpillar Men’s Second Shift Steel Toe Work Boot embraces originality in its workmanship. The boot features a genuine leather work that is the center of all the positives of the shoe. The boot comes with an original slip resistant rubber out-soles and a durable welt construction. This is an ever improving feature that’s been an edge for the Cat brand and is uniquely done. The originality and genuineness of these materials then goes ahead in guaranteeing the safety, luxury and durability of the boot. Resistance and security. The slip and water resistant feature is the key selling point that makes the boot efficient and safe in that risky and slippery working area. For a shoe to be safety-centered and ensure comfort a slip resistant out-sole is very important. The oil resistant traction out-sole completes an industrial footwear that ensures safety. The steel-toe work boot also ensures no injuries in case of heavy objects falling or rolling over your feet.Highly certified, recommended and good brand image. Cat footwear is well placed and ranked in the footwear history and industry. The boot under many reviews rates as the most sold boot so far in the year 2017. It’s been widely recommended by truck drivers and industry workers mostly because of its safety features and comfort. The boot meets a lot of industry security measures especially with the slip resistant and steel toe features. The Caterpillar Men’s Second Shift Steel Toe Work Boot offers all in one shoe: safety, comfort and style, you can’t go wrong with this boot. Looking for boots that will stay tough, will not make your feet in pain when hiking, will keep your feet dry when walking through water and will last for a long time? Oh boy, it sounds like a dream but trust me it isn’t! These Chippewa boots scream quality and it’s something you definitely want more than a cheap pair of boots that will last a month. Chippewa, founded in 1901, always delivers high-quality pairs of boots. When you are looking at its price tag you’re wondering that getting some cheaper ones will save you money, but the truth is that this is the best choice in the long run because it will last forever all the while offering you the best a pair of boots can give you! It’s considered to be among the better ones in the market and that’s for a reason! We all know that leather boots are way better than boots made from other materials. They are one of the most desired materials when it comes to boots and The Chippewa Men’s 9″ Waterproof Insulated Steel-Toe EH Logger Boots are made out of it. The boots’ advantages are listed below to provide you with the information you need to be sure they will be worth every single one of your dollars! Comfortable. They make for the most comfortable boots because the leather will mold to your foot rather than the other way around! It’s probably the most desired characteristic of leather as no other material can compete in that aspect. Not comfortable shoes is most certainly a choice you will regret. However, leather boots such as these will fit your foot perfectly for sure! Easy to clean. Not much maintenance is needed for leather shoes. All you need to take care of your shining babies is a damp cloth and a minute of your time every now and then and you’re done. They will always look nice if you do this one thing! They are breathable. They let air pass through them making your feet cool when the temperature around you is high. This is especially nice when you’re hiking in the summer and it is very hot. You will be glad you purchased these boots and no other as you will feel almost no heat on your feet whatsoever! Don’t smell bad. Leather generally doesn’t smell bad at all. Actually, it naturally smells nice too! No need for extra measures to prevent your boots from smelling bad. With these boots, you will be able to take them off at a guest’s house without second thoughts. Durability. Leather also provides natural durability to the shoe which makes it last for very long. These boots won’t go down without a fight, you will be sure they will last for years! Waterproof. Step into waters all you like, your feet will never get wet! This means that your feet will be happy when walking through heavy rain or just plain wet terrain! Style. Even if you ignore all the benefits above, you can’t ignore that they look awesome! Leather surprisingly gives everything a nicer look and so does for these boots. All in all, you can’t go wrong with these boots when they have all these benefits and especially when they’re made from a company that knows its job for over a century! It might be a little more expensive than the boots made from synthetic materials in the market, but since they have some many more advantages they are worth your money and will save you money in the long run because they will last forever! Are you looking for a high quality work boot? Would you be interested in a genuine boot that is rugged and built to last? Do you want to own a pair of boots that are made using durable and high quality material? Then look no further. You need to consider the Thorogood Men’s 814-4200 American Heritage boots. The boots have a cotton drill vamp lining and a dual density shock absorption insole. In addition, its midsole is made of PORON 4000 cushion rubber. The boot’s shank is made of fiberglass and offers good support for your ankles. It has a clamshell lacing design combined with rugged metal eyelets. Comfort. The Thorogood Men’s 814-4200 American Heritage are designed with your comfort in mind. As you work hard, however tough your job may be, the boots have a dual density insole that absorbs shock. You can remove the insole to clean it when the need arises. The boot’s PORON 4000 comfort rubber midsole and cotton drill vamp lining ensures that your feet are relaxed and comfortable in the boots. Practical. The boot’s out-sole is slip and oil resistant. When you encounter slippery conditions as you work, these boots will ensure that you do not succumb and remain firmly on your feet. The tobacco gladiator leather upper on these boots is oil tanned and non-marking. 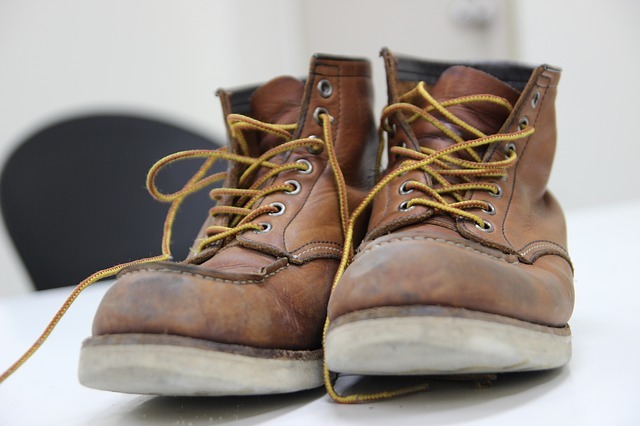 Any chemicals or unwanted substances that you may encounter will not leave unsightly marks on your boots. If you decide to stretch these boots to their limit, you will be pleasantly surprised. The Goodyear welt construction rubber wedge out-sole has been designed not to slip away from the upper leather part of the boot. Value for Money. The Thorogood boots will give you great value for your hard earned cash. The work boots are durable as they are constructed from high quality materials such as genuine leather and rubber. This ensures that they are not only comfortable, but will last you a long time. The boots are reasonably priced. You can get yourself a pair with their prices ranging from US $120 to slightly north of US $ 200. Definitely a great bargain. To Summarize – If you are looking for a high quality, durable American work boot, then the Thorogood Men’s 814-4200 American Heritage boots are your best choice. You will find that they fit you perfectly as they are well-built and designed to last. The Thorogood American Heritage boots offer you a perfect combination of unrivaled comfort, protection and great value for your money. So go on ahead and grab your wallets and credit cards. Get yourself a pair of these great American work boots. You are guaranteed to get stylish footwear that will provide adequate protection for your feet as you work. Whether you work in the construction or agricultural industries or whether you just enjoy engaging in practical DIY projects at home, it is crucial to have adequate footwear that will provide you with the requisite levels of safety. Tough, durable boots like these stylish products by Red Wing Heritage are a must as they will keep your feet safe from heavy items falling onto, or bashing into, your toes. In addition, these boots offer excellent traction, so you will not need to worry about slipping on uneven or wet surfaces. The latest in footwear technology. These boots are a fantastic blend of style and practicality. They have an eye catching ‘Moc-Toe’ design (from the shortened form of the word ‘moccasin’, a Moc toe features an upward facing seam) and are crafted from high quality, very strong leather. The outsoles of these boots are made from rubber, and the tread offers superior traction. This makes carrying heavy implements up an incline, or walking around a damp work environment, much safer and easier. Triple stitched and secured using a technique known as Norwegian welt construction, there is no danger of this sole coming loose from the shoe. Suitable for both casual and industrial use. As well as being perfect for wearing to work, these well made boots can be worn as part of a casual look. They go wonderfully well with a classic pair of jeans, for instance, or they can be used with chinos as part of a smart-casual ensemble. All in all, this is a great all round pair of boots. Get them muddy as you work outdoors, or keep them for best: it’s up to you! These boots have a very classic style to them which will never go out of fashion. This is especially good to hear given that they are designed to last for many years, so you will want to be wearing them day in and day out for at least a decade. Waterproof leather for additional comfort. The designers at Red Wing know that there are few things more miserable than having wet feet. The carefully designed eyelets and the excellent quality waterproofing on the leather of these boots means that they will protect your feet admirably well from damp conditions. The overlapping design of the tongue and the upper towards the top of the boot also provides a protective layer against the damp. Stability and ankle support. The strong and supportive design of these boots means that they provide a stable surface for standing on, and lots of support for your sole – essential when lifting heavy items. Furthermore, they are built up at the top and the leather is nice and rigid (though it feels supple as you pull the boot on), so they will give your ankle the all important support that you need. To Summarize it, those are fantastic boots. Strong, sturdy, and built to last: these classic looking boots are great for wearing to work, or just as the finishing touch on a casual outfit. Known for its commitment to Innovation, Keen’s high-quality products have made its customers to experience the wild outdoors with confidence. Keen is one brand that has brought style and safety together with the Utility Men’s Atlanta Cool Steel Toe Work Shoe. Keen Shoes are made from high-quality imported breathable leather and mesh, accompanied by heavy duty rubber sole tough enough to withstand heavy wear and tear of even the most demanding job. The shoes are left and right asymmetrical and are designed such way to offer maximum protection to the toes. Keen’s patented toe protection extends the outsoles to wrap up all the way on the top to offer extra safety to the toes. Its non-slippery rubber outsole holds you upright and safe even at worst situraion like oil spill floors and watery surfaces. It’s not just a shoe. It’s advanced engineering. Made with technological advancements such as Keen.Dry, a proprietary waterproof system that allows vapor out and but never lets water in. Keeps your feet cool and dry at the same time. Its unique metanomical footbed design is anatomically engineered to provide maximum arch support and is designed to flow along the shape of your foot. Well thought and researched multiple patented technologies protect your feet from all possible disasters that can happen at your workplace at any time. The next level of shoe design is here. A shoe that can look casual yet perform its heavy duty functions is quite amazing. Poor grade shoes may damage your feet especially if you are working in a harsh environment. Prolonged usage may even cause irreparable damage to your legs and feet. Keen’s Cool Steel Toe Shoe is one of a kind, protective foot gear which is ready to take on the challenges that your job throws. It is always wise to invest in a worthy pair of shoes that can be your companion whether it is your workplace or any outdoor under the sun. The Timberland PRO Men’s Direct Attach Six-Inch Soft-Toe Boot is one of the most beautiful footwear for men available in the market nowadays. The footwear comes in four colors which includes Black, Wheat Nubuck, Brown Oiled Full Grain and Brown. The footwear is an all purpose work boot that could be worn under any circumstance. Comfort Suspension System. The footwear uses a comfort suspension system that helps reduce foot fatigue that occurs as a result of putting on a shoe for a long time. The boot has a contoured shock diffusion plate that reduces the pressure on the foot when walking, climbing or just standing for a long time. Waterproof Protection. Another unique feature of this boot that makes it an all purpose footwear is its waterproof protection. The boot uses a sealed waterproof leather all round as an insulation that reduces the effect of moisture on the boot. This ensures that the feet is kept dry even when the boot comes in contact with water. This is a type of shoe that is good for construction workers. Waterproof protection ensures that the boot can be used during winter and snowy conditions. The boot also has a rubber sole which cannot be damaged by a long term exposure to moisture. Mesh lining with anti-microbial treatment. The footwear has a mesh lining that contains anti-microbial treatment. This feature has two benefits. One is that they make the feet comfortable, the other is that it reduces the risk of foot infections that can be associated with a long term use of a footwear. The Timberland PRO Men’s Direct Attach can be worn under extremely cold conditions without fear of disease infection on the feet. Steel Safety Toe for Protection. The footwear has a steel safety toe for protection of the toes. This is another reason why the boot is an all purpose footwear. The steel safety toe protection ensures that the boot can be used to work in places with heavy machinery like a construction site. Electrical Hazard Protection. The rubber soles of the footwear provides electrical hazard protection to the feet when worn. This ensures that the footwear can be used for working on electrical projects without any risk of electrical hazards. Moreso, the footwear can be worn for other activities or in locations where there is a potential risk of contact with electrical apparatus. Padded Top Collar. Another beneficial feature of the boot is its padded top collar which ensures that the feet is cushioned and comfortable for any length of time the footwear is worn. These are the top ten best work boots for 2017. If you have any remarks comments, or anything to add to the discussion, please free to comment below.